Business And Wildlife Groups Skip The Fight, Work Together To Save A Species When an animal is listed as endangered that can be bad news for nearby businesses. That's why Georgia's biggest utility is helping to protect the slow-breeding gopher tortoise. A female gopher tortoise, about 20 years old, at the Joseph W. Jones Ecological Research Center near Newton, Ga.
Gopher tortoises are big, dry, wrinkly reptiles that dig burrows underground in the parts of Georgia where the soil is sandy, down south and near the coast. To the people who study them, they're "cute," "quite personable," and "just a great little critter." To the 350-or-so other species of animals that use their burrows, they're property developers. To businesses, they're a potential problem. The U.S. 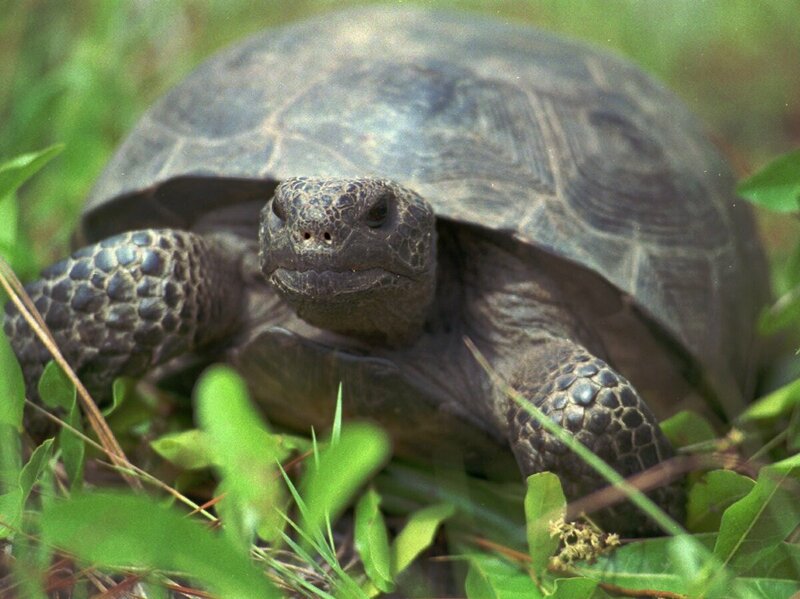 Fish and Wildlife Service is considering protecting gopher tortoises under the Endangered Species Act, and that could mean red tape and additional costs. Instead of fighting the potential listing, Georgia businesses are taking an unusual approach. They're working with wildlife agencies, private foundations, environmental groups – and even the Department of Defense – on a project to save the gopher tortoise. They hope to protect enough animals that federal regulation won't be necessary. The biggest company involved in what's called the Georgia Gopher Tortoise Initiative is Georgia Power, the largest electric company in the state. With all its power plants, it's also a major landowner. And gopher tortoises live at some of those plants, including Plant Hatch, a nuclear facility in south Georgia. "We're glad to have them here," says Georgia Power wildlife biologist Jim Ozier. "Gopher tortoises do very well right next door." 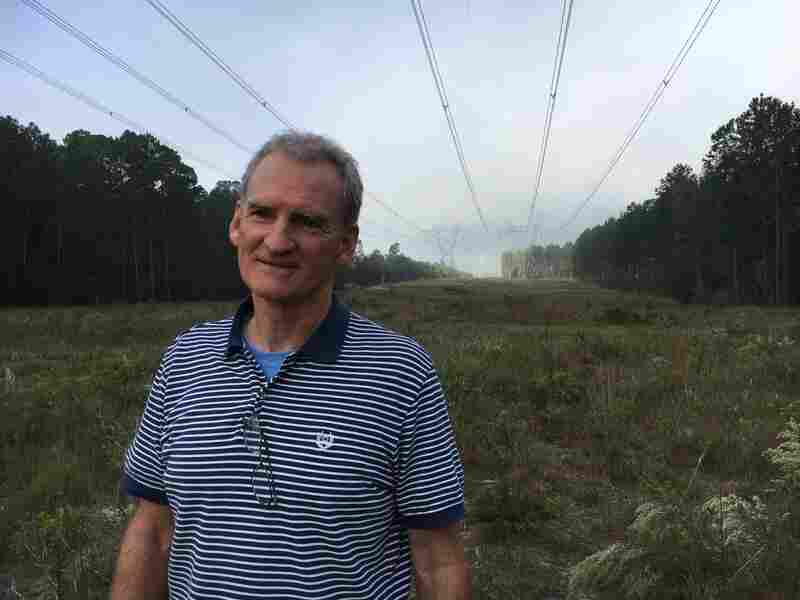 Georgia Power wildlife biologist Jim Ozier, standing under transmission lines running from Plant Hatch. The areas under power lines are good for plants and animals that need sun, Ozier says. Ozier says beyond planning around the tortoises to make sure they're not affected by plant maintenance, Georgia Power is also restoring the gopher tortoises' native habitat, the longleaf pine forest that would have grown here naturally. On a foggy morning he walks under high-voltage transmission lines running from Plant Hatch, searching for gopher tortoise burrows. Also on the hunt is Savannah McGuire, gopher tortoise crew leader with the Georgia Department of Natural Resources, and her team. When they find one, McGuire crouches next to the burrow to snake a camera down into it. The camera streams video to a monitor up above ground, so she can see what's in the burrow. "We'll stick it down the burrow and see if he's home," she says. "That's an adult gopher tortoise," she says, estimating it's about 40 years old and a foot wide. 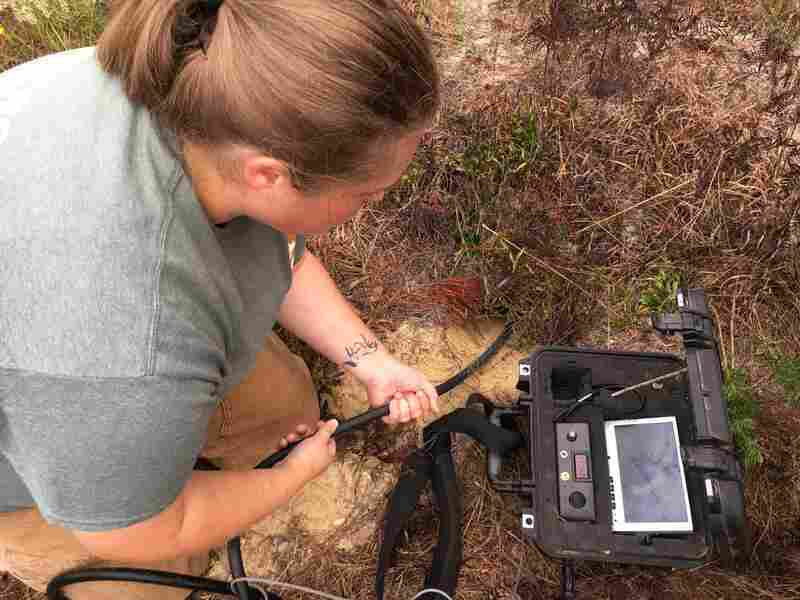 Savannah McGuire with the Georgia Department of Natural Resources maneuvers a camera down into a gopher tortoise burrow. Once gopher tortoises make it to adulthood, they're like "a fixture on the landscape," says Kurt Buhlmann, a senior research scientist at University of Georgia's Savannah River Ecology Lab. "They're like a rock. They're going to be there." But smaller ones get eaten by other animals. And there are fewer tortoises overall than there once were. Buhlmann says tortoise numbers have dropped partially because of habitat loss. The longleaf pine forests where the tortoises thrive have given way to tree plantations, development and solar farms. The wildfire that keeps longleaf pine healthy has been suppressed. There was once about 90 million acres of longleaf pine in the Southeast, according the Georgia Department of Natural Resources. Now there's more like three million acres. The tortoises also have a legacy problem. During the Great Depression, people ate them. They were nicknamed "Hoover's chickens." Because gopher tortoises mature and breed slowly, they still haven't bounced back. The Gopher Tortoise Initiative is working to address that by finding healthy gopher tortoise populations – whether they're on public land or private property – and protecting them where they are. Voluntarily, without federal regulation. The federal government, the state of Georgia and private foundations are raising $150 million for the Gopher Tortoise Initiative. "I recently heard that our new Secretary [of the Interior] Zinke is all about conservation without conflict, and this is clearly an example of that," says Don Imm, the U.S. Fish and Wildlife field supervisor in Georgia. Imm says if the science indicates that gopher tortoises should be federally protected, then they will be. But, he says, "if you can do something to avoid the conflict, or even the need to list, that's a much better result." It's better for businesses, too, says Doug Miell, a consultant with the Georgia Chamber of Commerce. "There's always a perception that business and industry and conservation groups are at loggerheads, that we don't agree on anything," Miell says. "This is a good example of where we can come together to demonstrate that, hey, we might be looking at it from different sides, but the outcome is the same." Tracey Tuberville is an associate research scientist at UGA's Savannah River Ecology Lab (and happens to be married to UGA's Buhlmann; neither of them is involved in the Georgia Gopher Tortoise Initiative). She says it's great that the partners in the Initiative are working on restoring the land, but in some cases, it's better to go a step further and actively reintroduce rare species. That's what her work focuses on. Still, she says what the Initiative is doing gives her hope for gopher tortoises. "I actually am very optimistic that they are a species you can recover," she says. "Everybody has the same goal. Even if it's just to make sure they're not listed, in the end that means effective conservation for tortoises."